Two weeks ago, we discussed ‘the Education Triangle:’ the student, the parent(s)/guardian(s) and the teacher/school. 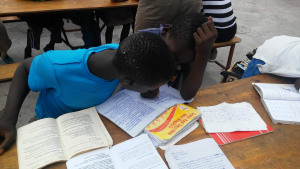 We noted that very few parents of the 20 children from Guepard Boxing Club who we send to school in Cité Soleil, Haiti have had formal education. The role of the guardian under these circumstances becomes one of encouragement because the parent is unable to assist and mentor the child with her academic work and homework. Always attentive and concerned with the performance as we see it reflected on the quarterly report cards, we’ve discussed ways that our boxing partners at Guepard can help the children improve. One of the managers suggested that he would begin to teach the children English after school. This did not surprise me. 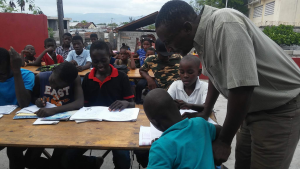 English instruction seems to be a ‘hot button’ for many NGO’s and non-profit organizations that work in Haiti. It is a noble idea, but on reflection, I find little value in teaching ‘English’ to ghetto children in poverty-stricken, third world countries. 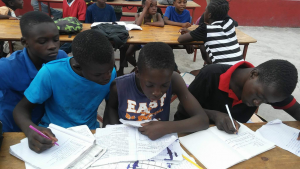 The 20 students from Guepard Boxing Club (GBCCS) that we financially support in school have a cumulative 65% (from 88% to 42%) in Creole, the native language; and 54% (from 77% to 24%) in French, the national language. “The students must learn French and Creole before they are ready to study English,” I suggested to manager Justin Ricot, “If they cannot speak, read and write Creole and French, they will be unable to effectively speak, read and write English.” Taken another step, to function within his own country, a child must be able to communicate with her own language. Our objective is not to ‘Americanize’ children, rather to make them good citizens in their own country, which improves the world we share. True to their word, these young men work twice each week for one hour before boxing practice with the Guepard children who attend Foi de Job. The final report cards in June will help us understand the effectiveness of the additional work the managers at GBCCS provide, but one thing is certain, and it is written on the faces of the children who come to Justin, Djo and the others for extra help: these kids are excited about learning. A word of acknowledgment… Justin, Jaru, Apino and the coaches and managers at GBCCS receive no pay, salary or compensation for the many hours they spend each week working with the Guepard kids from Cité Soleil. 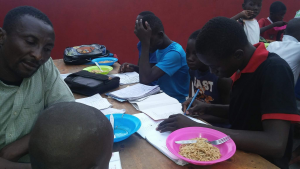 It is difficult enough to raise funds to feed the kids after each training session and to support other activities – like sending 20 of the more than 100 children in the club to school. Every penny they can save goes to the children they serve. To continue feeding the children and sending more to school, we humbly ask for your help. 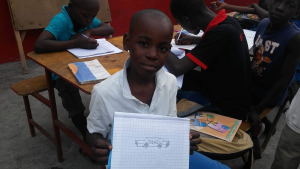 You can make a tax-exempt donation to Guepard Boxing Club in Cité Soleil, Haiti through Gail Rongen’s Nicole Megaloudis Foundation by clicking the donate button. Please consider helping the Guepard Boxing Club. Together, we are helping people to help themselves. I have taught English over the years to people who were generally not very educated in their first language, usually Spanish. One of the trends I heard of was to teach people their first language and then go into English. There is a need for literacy all over the world. I agree. Our ability to function in the world is strongly influenced by our ability to communicate effectively.